From Los Angeles to Miami, the setting may be different but one thing stays the same: Street racing. 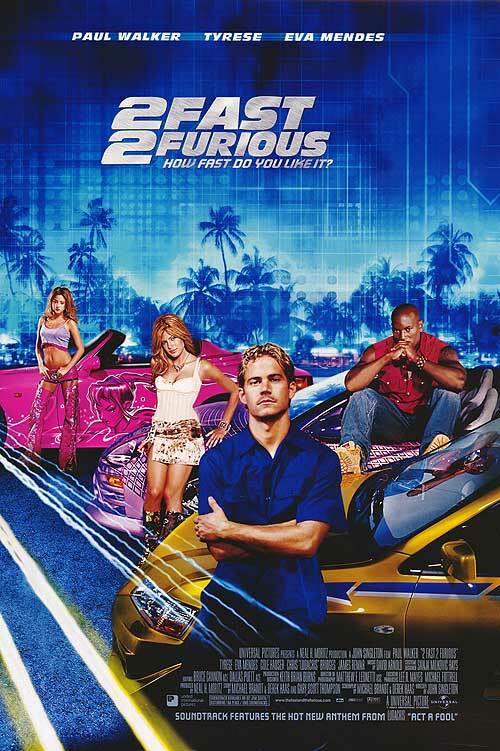 2 Fast 2 Furious sets up shop in the Dirty South this time, where former police officer and now wanted man Brian O’Connor (Paul Walker) makes his living as a full-time racer. He may no longer have the badge, but he still possesses top-notch driving skills that have only improved in the years since we’ve seen him last. One night after flexing his muscle some more on the track, Brian is finally apprehended by the local authorities. He is given a opportunity though. The authorities are after big time area drug lord Carter Verone, but need skilled racers like Brian to nail the guy. Brian accepts but only when bringing along his old but now distant friend Roman Pearce (Tyrese Gibson), also a wizard behind the wheel. The reward for taking down Verone? Clean criminal records for both men. Entertainment. That is all these movies in the F&F franchise are. On a baseline level all provide some form of car action, and if you like that, chances are you find these flicks somewhat enjoyable. Some do the entertainment thing better than others and actually include good elements of a strong flick (the 2nd half of the franchise) whereas others are sort of just there. There are some movies that are perfect “viewing” when on in the background. They don’t require a lot of thought and look cool enough visually and simple enough to pop in and out of knowing exactly what is going on. 2 Fast 2 Furious is one of those movies. 2 Fast 2 Furious may be a sequel in chronological sense to The Fast and the Furious, but it doesn’t really come off as such. Sure Walker’s back, but Vin Diesel, Jordana Brewster, and and Michelle Rodriguez are all absent from this installment. In their place are Tyrese, Eva Mendes, Ludacris, and Devon Aoki, none of whom are as intriguing as who they are replacing. I’m sure the studio was all in on the franchise at this point, but it sure seems like they were covering their bases so to speak and building around Paul and the new blood, just in case Diesel and others decided not to return down the line. It is a good thing they did return, because as this (and the third) shows, it is hard to see F&F lasting longer without their presence. Still, there are some positives. The shift in location gives the movie a different vibe, both visually and tonally. Being in Miami presents 2 Fast with a brighter, “popping,” hotter, almost Miami-Vice-like look and sense. This lighter aesthetic translates into a movie that is more lighter in tone. Not to say that the previous was overly dark, but it did carry heavier character moments and even suspense. It isn’t necessarily a bad thing, it is just more hollow than the first. I hate these comparisons between the two, but with a franchise this big it does become harder not to. One comparison that remains consistent is the dumbed down, painful but sometimes hilarious dialogue. Expect to hear tons of ‘cuz’, ‘brah’,’partna’, and the like here. Did we really talk this way in 2003? At least the rudimentary dialogue is in line with the straight line story, which is only there to support the car sequences. Brainless is an apt descriptor of said story it with a dash of familiar staples found in other like-minded works. Suit wearing villain who deals drugs? Yep. Someone undercover attempting to break open the case but may be too deep? Here as well. When the film is in vehicular mode it is at its best, generally directed well enough by John Singleton with the feeling of real speed and handling mechanics, albeit with some CGI in places more noticeable than others (watch for the clear green screen near a beginning sequence). Only when the driving stops does 2 Fast get stuck in neutral or reverse. Never one to set the world on fire with his thespian skill, Paul Walker is nonetheless Brian O’Connor. He’s California cool, never rattled, and seems like a down-to earth guy who just happens to have crazy driving skill. Some of his delivery is amusing and so wooden but weirdly enough it is part of the reason why I enjoy the guy. He does have a presence in whatever he’s in though and that accounts for something. His partner this time is Tyrese, and he is firmly the comedic relief in this, spitting off streetwise one-liners in almost every scene. The character feels a little stretched as a star, but right at home as a supporting guy. The leading lady is none other than Eva Mendes. She is not asked to do a lot besides look amazing but she doesn’t detract from this either. Lastly, even if Cole Hauser’s villain is pretty generic, his performance is perfectly OK for this and he generally looks the part as a suave and pompous rich-guy criminal. The other characters of semi-importance are played by models and rappers mostly, and that is all that needs to be said. One is passable in an acting-wise and others are laughable. To those who are not fans of the franchise or of films in this ilk, 2 Fast 2 Furious will have no redeeming qualities whatsoever. For the rest, 2F2F is just an average, mindless flick that provides a decent and light watch when there’s nothing else on. Simple as that, bro. Photo credits go to IMDB.com, movieposter.com, and metopal.com. I think the latter half of the franchise is better, but I’m inclined to agree with you. Thanks for the comment! No problem with that! I do think the latter movies gets better, but if there is no interest to start with, I think it’s smart to stay away!